Are you thinking about setting up your own indoor Cannabis garden? If so, you may be wondering if you should be using one of the new full spectrum L﻿ED﻿ grow lights. Initially it may be confusing which one is these is best for your situation. These work really well for someone setting up a small cannabis indoor garden and want to use the latest lighting technology available. Check out our review of the Best Grow Tents. Before you decide on buying LED grow lights for your cannabis plants you need to know why you should buy it. 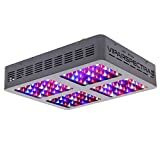 These reviews should help you decide for yourself which LED grow light kits are optimal for your marijuana indoor garden. We review newly released panels every year to keep up with the latest technology. To get the biggest, highest potent buds you will want to use the nutrients specifically developed for growing weed. Do not buy an LED Grow panel before reading these reviews. Buying a cheap led grow light might not be your best option. Quality lights last longer, provide better light spectrum and can be used for both grow and flowering stages. No matter if you are going Hydroponically or in soil, LED grow lights will increase your yields. Starting with clones ensures all your plants are females. 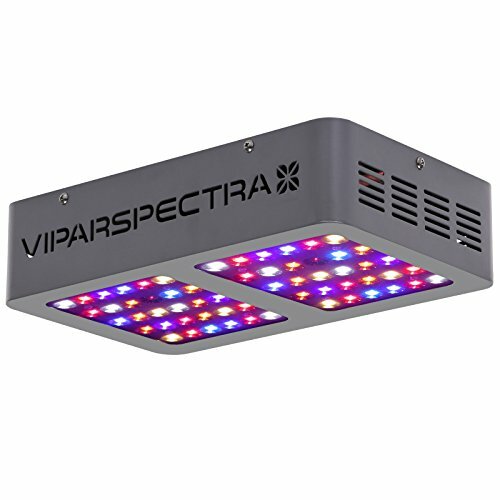 The ​VIPARSPECTRA Reflector Series 300W only uses 136 watts. Optimally configured with red, blue and white LEDs for a total of (60) 5 watt EpiLEDs diodes for all stages of growth leaning more towards the blue spectrum for the vegetative stage. The light produced is so bright that it’ll be unwise to stare at it with the naked, unshielded eye. The VIPARSPECTRA Reflector Series 300 watt has a single 4.72" fan for cooling. The fan draws air in thru the side vents, across the heat sink and blow out the top. This is petty standard with other comparable units. The VIPARSPECTRA Reflector Series 300 is perfect for a small garden 2x2' with a maximum area of 3x3'. Compares to an traditional 250 HPS bulb. Expanding your indoor garden is relatively easy by adding additional panels by daisy chaining them together. No special cables are needed. Just plug the power cable from one unit into the other as shown below. 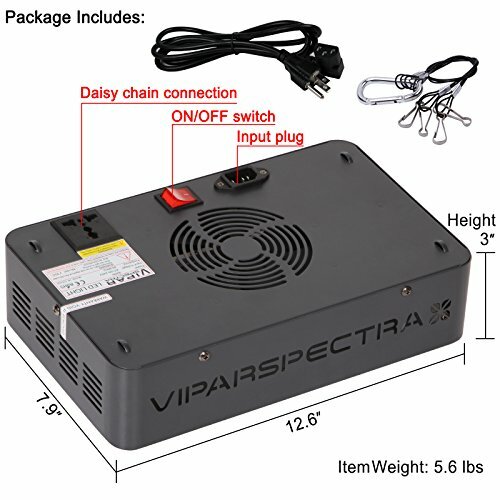 The VIPARSPECTRA Reflector Series 300 Watt is great for someone starting out with a small cannabis garden 2x2'. It has a well balanced spectrum for both vegetative and flower stages. 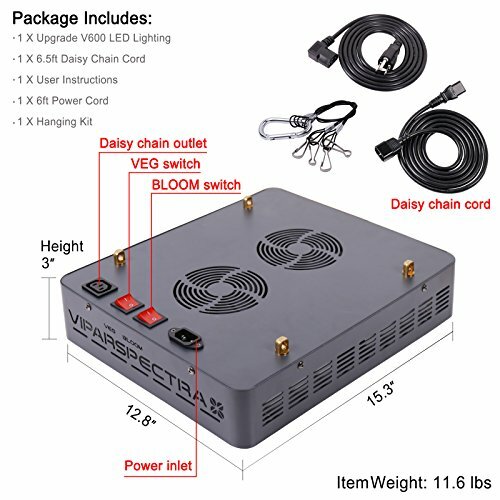 The VIPARSECTRA Reflector Series 300 Watt is the best LED grow light for a small closet indoor garden for the price. The VARASPECTRA Reflector Series 600W panel can be switched between vegetative and flowering stages as needed. Perfect for a small grow tent. Optimally configured with red, blue and white LEDs for a total of (120) 5 watt EpiLEDs diodes for all stages of growth leaning more towards the blue spectrum for the vegetative stage. The VIPARSPECTRA Reflector Series 600 watt panel has two 4.72" fan for cooling. The fan draws air in thru the side vents, across the heat sink and blow out the top. This is petty standard with other comparable LED grow panels. The VIPARSPECTRA Reflector Series 600 is perfect for a small garden 3x3' with a maximum area of 4x4'. Compares to an traditional 600w HPS. Expanding your indoor garden is relatively easy by adding additional fixtures by daisy chaining them together. No special cables are needed. Just plug the power cable from one unit into the other as shown below. The VIPARSPECTRA Refl​​ector Series 600W is the big brother to the VIPARSPECTRA Reflector Series 300W with the added benefit of being able to switch between vegetative and flowering stages. I'd recommend using one for a small marijuana garden 3x3'. Adding another panel you can easily increase your coverage for a medium marijuana indoor garden of 3x6'. 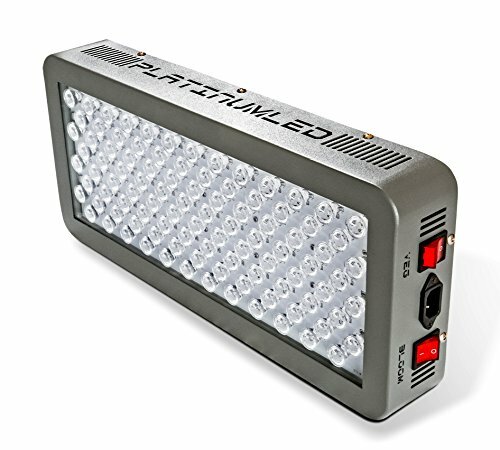 The Advanced Platinum Series P300 is a 12 band grow light that boasts PAR or Lumens highest output per watt of up to 3x the normal light provided by most manufactures. The best made in the USA LED Grow panels on the market at this price point. It provides the most efficient full spectrum light for all stages of growth and is recommended for growing medical marijuana. There are (100) 3 watt high quality diodes built by BridgeLUX and Cree. With a 5 year warranty, you are assured they run without issue for many years. There are two large quiet running fans with upgraded aluminum heat sinks ensuring the unit stay cool. The coverage is 4.5′ x 3.8′, and can be combined with multiple units for a larger indoor Cannabis garden. Provides 12 bands of light from UV to IR providing growers a complete spectrum of light for all stages of growth. The Advanced Platinum Series P300 has the ability to switch between different growth cycles. Using 93 watts on Veg and 180 watts for bloom. During the flowering stage I would use both spectrums for a total of 273 watts. With the most efficient light for their growth stage, perfect for vegetative and flowering plants. 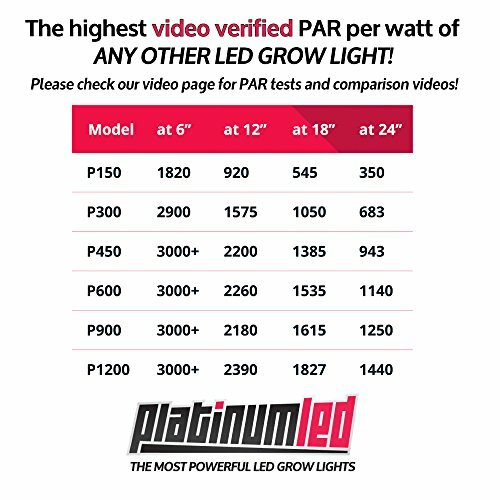 The Advanced Platinum Series P300 has the highest PAR per watt rating in the industry. Combine that with the 12 band full spectrum and the ability to switch between veg/bloom at the flip of the switch, this makes the P300 the winner in the 2019 BEST LED Grow Light. The MarsHydro Reflector 96 only uses 200 watts. One of their most popular in their lineup is the Reflector Series. The MarsHydro Reflector 96 has ten bands of light in the 430~440nm, 450~475nm 620~630nm, 650~660nm and IR 730nm. All MarsHydro Reflector Series LED panel only use high quality 5 watt EpiStar diodes. The recommended coverage is 2′ x 2′, and can be combined with multiple units for a larger indoor Cannabis garden. 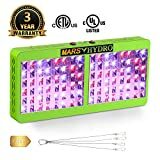 The Marshydro Reflector 96 has the ability to switch between different growing stages. It is rated at 200 watts with both Veg & Bloom enabled. The MarsHydro Reflector 96 Series is one of the best performing low budget LED grow bulbs on the market. It would be my second choice if you can't afford the Advanced Platinum P300. The Galaxyhydro 300 Watt is designed for the indoor grower and can emit light that supports both vegetative and flowering growth cycles. The Galaxyhydro covers 9 bands of the spectrum of PAR (photosynthetic active radiation). The wavelengths include blue spectra, red spectra, as well as UV and IR and white light. The spectrum ranges from 430nm to 730nm. The Galaxyhydro 300w has the optimal ratio of red and blue lights for your cannabis plants for both vegetative and flowering stages. Ultraviolet and infrared light with the function of sterilization of the plant surfaces of bacteria, stimulating cell division and increasing the overall growth. The Galaxyhydro 300 Watt has 3 UL approved fans that draw air in from the side and out the top. You can literally hang the LED grow panel within a couple inches of your plants maximizing light penetration . Great for closet growers. The dimmer switch on the Galaxyhydro 300w allows you to adjust the intensity of the light. This is the only budget grow bulb that has this feature. Setting the intensity low enables you to use the GalaxyHydro for your cannabis clones instead of using florescent tubes. Increasing the intensity as your clones are ready to go into vegetative stage. The Galaxy Hydro can be daisy-chained using the supplied power cords. Daisy chaining 3-4 panels will not overload your electrical circuit as they only use 140 watts each. You can easily expand your grow area very easily to up to 8x2ft. 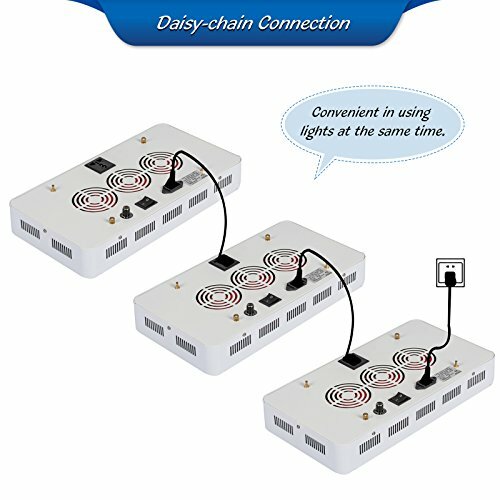 Daisy chaining minimizes the clutter of power cords in a small grow room. The Galaxyhydro 300W is great option for someone with a limited budget and a small garden. If you have a large grow room, I would suggest you consider upgrading to a panel with an adjustable spectrum so you can select veg or bloom spectrum. The California Lightworks SolarStorm 880 is the most powerful on the market in this category, using only 680 watts during flowering stage with LED/UVB setting. Bloom Mode: The spectrum comprises of intense levels of deep red and red with the right balance of deep blue and blue for the growth of the bloom. Veg Mode: The spectrum comprises of high levels of deep blue and blue with the right balance of deep red and red to enable massive vegetative development without stretching them. UVB Mode: The UVB feature is designed for the finishing phase to further increase crop potency. The SolarStorm 880 has a 5-band spectrum that includes deep red (665 nm), red (620 nm, blue (470 nm), deep blue (440 nm) and warm white light (3100K). The California Lightworks SolarStorm 880 is capable of covering a 4x4' area and is equivalent to an 1000 watt HPS. The actual wattage used depends on which of the three modes you're using: in veg mode the unit uses 475 watts, in bloom mode it consumes 650 watts and in bloom mode with UVB bulb running it draws 680 watts. California Lightworks outfits their SolarStorm 880 with 288 five watt Osram SSL diodes. These are some of the highest quality diodes available. They are rated for 80,000 hours. For comparison, most other LED companies use diodes rated for 50,000 hours. Only NextLight has a longer lifespan (100,000 hours). California Lightworks is a USA company from California with one of the best reputations in the industry. The California Lightworks SolarStorm 880 actually delivers on it claims and is one of the few 1000 watt HPS equivalent lights. If you're looking for a smaller version check out the California Lightworks SolarStorm 440 Review. 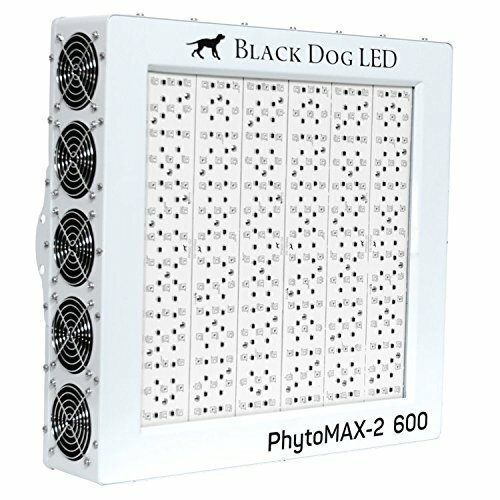 Unlike other manufacturers, Black Dog LED PhytoMAX-2 600 uses the actual wattage in their product names. Thus, the Phytomax 600 actually consumes 600 watts and is equivalent to using a 900 watt HPS. The Black Dog PhytoMAX-2 600 delivers the most powerful and reliable, true full-spectrum (365-750nm, UV to NIR) light available. Black Dog LEDs feature their Phyto-Genesis Spectrum™, which they developed after 5 years of extensive research. It includes light from 365 nm to 750 nm. That means it has all the wavelengths from UV-A to IR—basically every color of light plants need during any stage of growth. Black Dog PhytoMAX-2 lights do not have separate modes for veg and bloom. As for the effectiveness of Black Dog's spectrum: it has outperformed every other type of light (HPS bulbs, standard MH bulbs, light-emitting ceramic MH bulbs, induction bulbs, fluorescent bulbs and "white" LEDs) in equal-wattage tests. This light will give you a 4.25 by 4.25 foot coverage area during flowering and a 6 by 6 foot coverage during veg. Black Dog fixtures distribute their light much more evenly throughout the coverage area, so while you get less power in the center, you get more power on the outside of the coverage area and more average power overall. Black Dog use 5 watt diodes that are more powerful and efficient than competing lights. These high quality diodes are extremely bright and penetrate deep into the canopy. Overall, the Black Dog LED PhytoMAX-2 600 offers the best combination of coverage and canopy penetration. As a result, you get more even growth and the highest yields available. 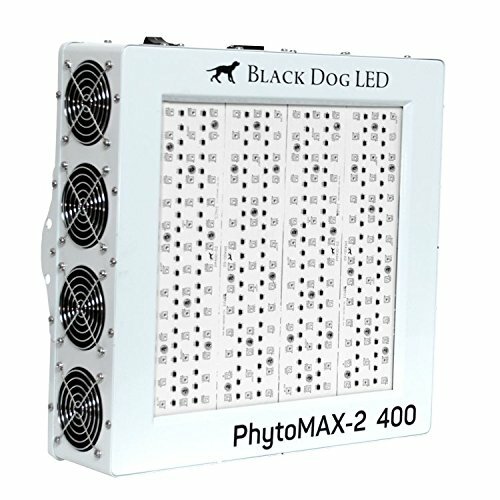 Unlike other manufacturers, Black Dog LED PhytoMAX-2 400 uses the actual wattage in their product names. Thus, the Phytomax 400 actually consumes 400 watts and is equivalent to using a 600 watt HPS. The ​Black Dog PhytoMAX-2 400 delivers the most powerful and reliable, true full-spectrum (365-750nm, UV to NIR) light available. This light will give you a 3.5 by 3.5 foot coverage area during flowering and a 6 by 6 foot coverage during veg. Works perfectly for a 4x4 Gorilla grow tent. 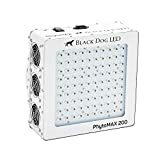 The ​Black Dog LED PhytoMAX-2 400 is the perfect choice for a 4x4' Gorilla grow tent. Offering the best combination of coverage and canopy penetration. Provides even growth and the highest yields available. 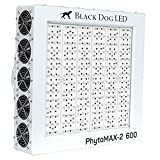 I would highly recommend the Black Dog PhytoMAX 400 for your small Cannabis garden. The KINDLED K5 XL750 comes with a fully customizable spectrum, built-in timer and sunrise/sunset function is one of a KIND. 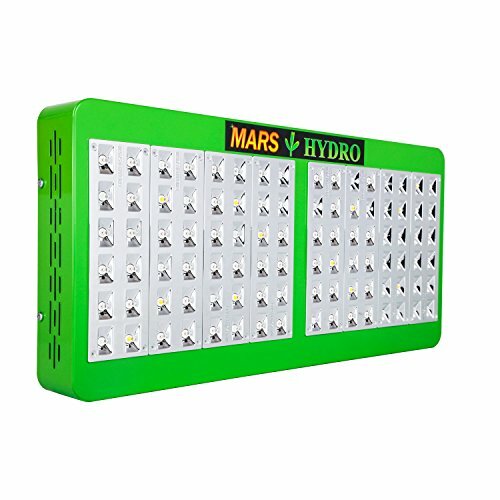 The panel uses only about half the electricity as HPS lights, and produce much more yield per watt. 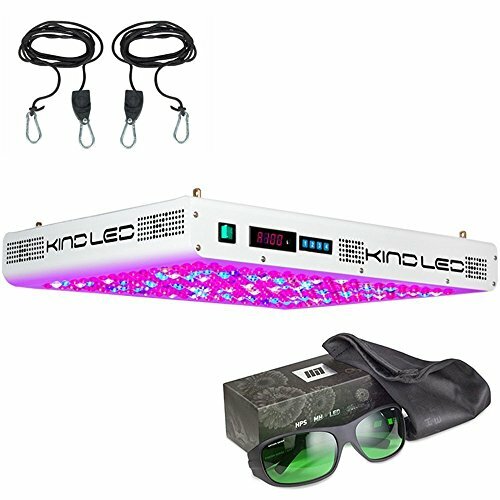 Using on 430 watts the KINDLED K5 XL750 grow light is a true replacement for a 1000 watt HPS system. In the real world, the sunrise gently intensifies as time goes on throughout the middle of the day. During sunset, the intensity dims and eventually goes dark. This exact function has been built into the XL750 to fully mimic mother nature. In fact, there are a total of eight different stages that the panel goes through as it turns on and turns off, giving your garden a gentle awakening in the morning, and a gentle pattern of darkness as it dims during the sunset. The KIND K5 XL750 comes with a free remote control. When the panel is setup and operating in the growing environment, you don’t have to reach over or underneath your plants to adjust the settings that the panel provides. The KIND K5 XL750 has a built-in timer so there is no need for an external timer since one is integrated and fully customizable. The panel covers a 3' x 3' (Flower) or 4' x 4' (Veg) area and replaces a 1000 watt HPS setup, while only drawing 430 watts. The Kind K5 XL750 features a customizable spectrum, 8 light stages, and built in timing for full control over your valuable grow. It has four large diameter ball-bearing fans that are constantly running over an array of heatsinks to provide ample heat dissipation for the entire duration of the light cycle. Each one is ventilated through the top panel as they blow a gentle breeze to make certain that overheating is never a problem. The KIND LED K5 XL750 is the only panel that attempts to simulate sunrise and sunset for a more natural lighting. With a built-in timer there is no need for an external timer. With a full customizable spectrum you are totally in control of Cannabis garden during the vegetative and flowering stages. You are guaranteed to get increased yields compared to using HPS. Kind LED Grow Lights are truly one of a KIND. As more States have moved towards the legalization of marijuana led to increased indoor growing of Cannabis. And in a bid to maximize yields, growers of weed have resorted to using kits as they consume less electricity, produce minimal heat and produce high marijuana yields. In this regard, modern kits are years ahead of their predecessors that were rarely used in the indoor growing of weed. When buying led grow lights for your marijuana growing needs, there are a number of things you need to consider. Below are the main factors to consider in your search for the best LED grow panel for marijuana. When buying a panel for indoor marijuana it is important to consider the amount of indoor space you have dedicated to the growing of marijuana. The space you have dedicated to the growing of weed will dictate the size and number of growing panels you require. As a basic rule of thumb, the minimum wattage you should get is 50 watt. With a 50 watt light, you can comfortably grow weed in one square foot of space. Therefore, the minimum grow space to power ration is 50 watt per 1 square foot of space. That being said, it is important you calculate the size of the area that your indoor weed occupies. For example, if your marijuana occupies 4 square feet of space then you will need a minimum of 200 watts. If on the other hand, your marijuana takes up 16 square feet of your indoor space go for a more powerful 800 watt light. The general rule is that more wattage results in more yields. Thus, it is wise to go for most power you can afford. As with any other appliance, price is an important factor to consider when choosing a panel for growing marijuana. However, it should never be the main factor that influences your decisions when selecting led grow light kits. The main reason why LED lights are in so much demand is they save on electricity costs and bulb replacement costs. 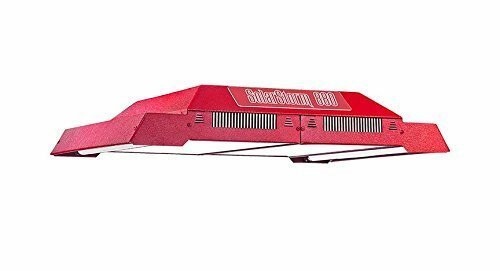 If you are looking to supplement your existing grow lights, panels are great the way to go since minimal additional heat is generated. There are other cheaper led grow light options available that you can take advantage of if you are growing marijuana on a small scale, panels are the only way to grow indoors. Nevertheless, light emitting diode panels are priced differently. Thus, there are those that cost upwards of $1000 and there are others that cost as little as $ 100. Needless to say, a led grow light that costs $ 1000 will be more powerful than a $100 panel. As such, it is important to evaluate your light needs vis-a-vis your financial position. If you are a small scale grower looking to increase your yields, a $100 panel will be ideal. Contrastingly, if you have more marijuana to grow a $1000 led grow light will do a better job. A cheaper light will be incapable of providing light efficiently. To get a balance between price and performance go for a mid-range led grow light. These are lights that cost between $200 and $500. These lights offer more power compared to $100 grow lights but are less expensive than $1000 kits. In the past, you only had two options to choose from, white and panels of specific colours, such as red or green. Today, there are more options to select from. However, all the options available can be categorized into two broad categories, white LEDs, and multi-band LEDs. White LEDs mimic the rays of the sun and are said to be more closely related to natural sunlight. Therefore, there are many people who prefer white LEDs to multi-band. So which of the two is the right one for you? Well, it all depends on your preference and what you are growing. The biggest problem with white light emitting diodes are that they emit green and yellow spectrums, which are not required by plants. Therefore, these lights are less efficient as the green and yellow lights go to waste. Multi-band lights, on the other hand, do not have this problem, making them more ideal for large scale growing of marijuana. Unlike white light emitting diodes, multi-band panels produce different spectrums including white spectrums. Therefore, they are able to emit the specific spectrum needed by marijuana plants. Most full spectrum LED grow lights have customizable spectrums. This means they can be programmed to emit a specific spectrum. The benefit of this is that you are able to save on energy costs without exposing your plant to unwanted spectrums. For efficiency and flexibility, choose an LED grow light with more spectrums. The more programmable lights an LED grow light is able to produce the more efficient it will be. This is because marijuana plants grow in stages and each stage requires a different spectrum. The first stage is the vegetative stage, which takes between 1 week and 40 days and the second is the flowering stage which takes about 40 days. While the plant is in the flowering stage it will require a different light than when it is in the vegetative stage. Similar to any other product, the best led grow lights come with warranties. The warranties of different LED panels vary. Some manufacturers offer a warranty of up to 3 years while others offer a limited warranty of 1 year. When purchasing a led grow light be sure to check the warranty vis-a-vis what you are paying for it. An expensive panel will generally have a warranty of about 3 years while a cheaper panel will have a warranty of 1 year. For an LED grow light to be sufficient it needs to cover a large surface area of the marijuana being grown. This means that a small led grow light regardless of the light produced and wattage will be ineffective. Therefore, when purchasing an panel it is important to do as much research as possible. Many of the led grow lights on the market come as an assortment of smaller panels. The size of these individual lights will dictate the efficiency of the whole lamp as well as its size. A small light will have minimal penetrative power and will thus be ineffective. A large led grow light is able to cover a wider area and thus have more penetrative power. Therefore apart from efficiency, large lights are also cost effective. It will cost you less to buy two large panels than it will cost you to buy five or six small lights. Additionally, large led grow lights normally have a higher wattage compared to their smaller counterparts. Thus, with a larger panel you get more wattage, hence better yields as well as more penetrative power, which translates to greener herbs. In every market, there are bound to be cheap knock offs and the led grow light market is no exception. Ordinarily, they are made using metallic components; however, there are a few cheap knockoffs that are constructed using plastic. Plastic is less durable compared to metal and thus plastic lights will have a shorter lifespan. The most common metal used in the manufacture of best led grow lights are aluminum. The latter metallic material is a good conductor of heat and thus helps transfer any excess heat produced by the panel. This helps you minimize the amount of water you use on your marijuana. The biggest problem with conventional HPS bulbs is that they emit up to 80% of their energy in form of heat. Therefore, when you are using these bulbs you will have to water your plants regularly. LEDs, on the other hand, convert a meager 15% of their energy to heat. Thus, the aluminum housing goes a long way in reducing the amount of heat produced by the light emitting diodes. If you stumble on a plastic panel do not buy it regardless of how cheap it is as it will be expensive in the long run. One of the most important components of the best led grow lights are the drivers. There are two types of driver systems constant current and constant voltage. To ensure that your panel is long lasting go with one that has the constant current driver. The benefit of this driver system over the constant voltage system is that constant current keeps the current of the LED steady as temperature increases. The voltage tends to drop as temperatures increase. To counter this problem, it is wise to go for a constant current driver that maintains the LED’s steady voltage at all times. As a grower of marijuana, you will want a light designed specifically for the indoor growth of this plant. The problem is different grow lights are designed for different purposes. When buying a panel remember to go for a full spectrum version that can be switched between vegetative and flowering stages. A full spectrum light will be ideal for all stages of a plant’s growth. Many of the mid to high-end panels reviewed have the ability to switch between vegetative and flowering stages with a flip of the switch. This has two benefits, one being able to use less energy during the vegetative stage as Cannabis doesn't need as much light during this phase of growth. Second you will have the correct spectrum of light during the flowering stage to grow huge buds. Ideally, do some research into the different full spectrum led grow light brands available and choose the one you prefer. This is a rather technical factor to consider and is constantly overlooked because it is difficult to independently evaluate a light’s PAR value. In full the acronym PAR refers to photosynthetically active radiation. In simple terms, PAR is to plants what lumens are to humans. Thus, PAR is essential to the growth of any plant exposed to artificial light. The PAR values of a bulb are measured using a device known as spectroradiomet﻿er. Naturally, it is not easy to get your hands on such an instrument. Therefore, you will have to rely on the PAR readings claimed by the manufacturer. The ideal PAR spectrum is between 400nm and 700 nm. With improvements in technology modern LED grow bulbs are being fitted with additional technical features. While these features are meant to improve the efficiency, they are not always good. For example, some modern led grow lights feature an internal cooling system in the form of a fan. Essentially, these fans are designed to get rid of the excess heat that can shorten a light’s lifespan. However, a led grow light with a cooling fan might not be the best. This is because the additional cooling fan means an added component that is prone to wear and tear. This may increase the maintenance cost. It is worth noting that manufacturers install some of these technical features to entice you to buy their panels. Therefore, not all technical features are important and some you can do without. When buying a kit do not be enticed by the many technical features added to it as this may increase both the initial buying price as well as maintenance cost. A standard panel for marijuana with all the basic features will do just fine. However, in some instances having additional features is a good thing. For example, some panels have programmable spectrums, meaning you can switch between red, blue, green, yellow or white light. This feature makes it easy to use. Review panels before making the decision on which brand meets your requirements. Unlike other light sources, you can adjust the spectrum for the different plant stages (clone, vegetative & flowering). For cloning and vegetative plant growth stages they require light in the blue range (400-500nm) spectrum. Once you switch your marijuana plants into flowering stage it is highly recommended that you include 600-700nm red spectrum. Since we all want huge marijuana buds, the red spectrum is the most important spectrum. In a traditional indoor garden you would use a metal hydride for growing and then switch out to a High Pressure Sodium (HPS) bulb. Using a switchable led grow light this can be done with the flip of a switch, making it extremely easy to switch growth stages. The average led grow light uses approximately 40% less energy to produce the same output compared to HPS bulbs. In a small closet or grow tent indoor garden using a conventional HPS bulb you would need to have inline ventilation fan to control the temperature. panels run so much cooler so no additional fans are required. Total energy saving can be as much as 60%. Average lifespan is 50,000 - 100,000 hours for grow lights. HPS bulbs are rated up to 20,000 hours but there output drops dramatically after 5,000 hours. It is recommended that you switch out your HPS bulbs every 12-18 months to get the maximum output. LED grow panels on the other hand continue to provide the same output during their entire lifespan. LED grow lights are much thinner and have the reflector built-in. A standard HPS uses 1-2 feet for the bulb and reflector and an additional 1-2 feet between the bulb and plant tops. The average 300 watt LED panel is only 4 inches thick and can be placed within inches of the plant tops. For a very small closet or grow tents indoor marijuana gardens where space is at a premium, LED panels are your best choice. In conclusion, I hope this review of LED grow lights has helped you make the right choice and ultimately your selection should be based on the above-discussed factors as well as your brand preference. 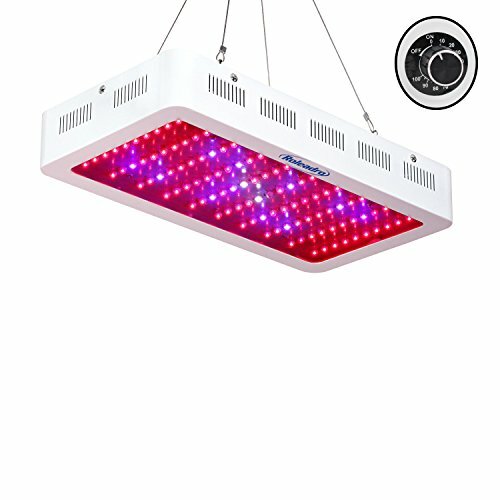 The Advanced Platinum Series P300 is the BEST USA made LED grow light that I recommend for an indoor marijuana garden and will guarantee the highest yields. We independently review panels to ensure you are getting the best possible lighting for your indoor marijuana garden. All the top led grow lights reviewed come with everything needed to get your cannabis plants growing. Each of the kits are reviewed come with the panel, power cord and hanging hardware, making them safer and faster to setup. Below are a few links to several blogs and government sites.